When users find themselves stuck between occasionally wanting to install a complete application and just visiting the platform every now and then, PWA comes to the rescue. PWA is an abbreviation for Progressive Web Application. Platforms, which are engineered to function as PWAs, are easier to use in the web, and provide users with an application-like experience. Twitter has already adapted to this new technology, and apparently Facebook is following suit. The feature has begun to roll out to users. However, the speed is remarked as slow. Currently, it is available to only a small percentage of people, and that too in certain parts of the world. 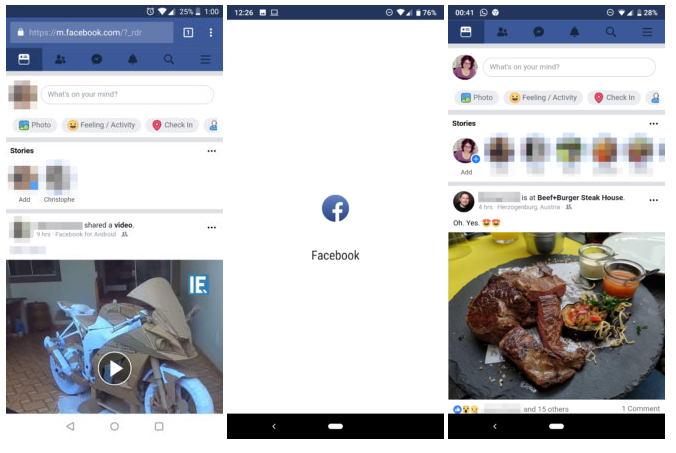 A PWA Facebook version is going to be very different from the non-PWA type in terms of outlook and experience. When a person logs in to his / her account on Chrome (or any other PWA supporting web browser for that matter), a new pop-up at the bottom of the page asks if the user to wishes to have the site added to his / her Home Screen. Once added, the icon of PWA Facebook looks different from the other version. It is rounded, and does not have a Chrome label attached to it. Moreover, the feel of the application, once run, is also different. The regular, non-PWA gets the user inside a new tab of Chrome, with the site address and menu bar on display. The PWA prototype instead opens an app like screen for the user. Another benefit is that this new Facebook web app appears in the overview tab separately, so one can switch between it and some other Chrome tab, without having to close one. What differences this new feature would bring content-wise, is not known yet. We would have to just wait and see until it is made available to users globally.